Why do people go to Mass? Why do you go to Mass? If you ask people — or yourself — that question, you will likely hear that people are in church to receive comfort, to be with friends, to receive inspiration, to get strength for the week, because they feel obligated, because they like the priest, because they owe an hour a week to God. Here’s another question. As a pastoral leader, what do you teach parishioners about why the church has Mass? As a parish, we could provide comfort, a community of friends, spiritual strength and inspiration, and so on without celebrating Mass. Why Mass? The Constitution on the Sacred Liturgy, the first document issued by the Second Vatican Council, tells us that the liturgy accomplishes our redemption (2). That’s a bit churchy sounding and may not resonate at first. But listen to the way Pope Francis says it. In other words, we go to Mass to encounter Christ, and let that encounter change us. As changed people, we put Jesus’s commandment to redeem the world into practice. Because of our sacramental encounter, we become credible witness to the world of the good news of Jesus Christ. We go to Mass to save the world. That may sound incredulous, but the salvation of the world is at the core of the liturgical reform. The first section of the Constitution on the Sacred Liturgy is titled: “The Nature of the Sacred Liturgy and Its Importance in the Church’s Life.” That section begins by telling us that God “wills that all [people] be saved and come to the knowledge of the truth” (5). As Christians, we believe that the salvation of the world happens because of Jesus. Jesus was sent to us by God to “to preach the gospel to the poor, to heal the contrite of heart” and to be “the instrument of our salvation” (5). For many of us, I think our faith pauses there. We believe that Jesus was sent to save the world. Go Jesus! The challenge to our faith, however, is part two. Just as God sent Jesus, Jesus sends us. The liturgy, especially Sunday Mass, “sets [us] on fire.” From the liturgy “a font [of] grace is poured forth on us.” In the liturgy, the salvation of the world and the glorification of God “is achieved in the most efficacious possible way” (10). If you are a musician, lector, communion minister, liturgy planner, parish council member, or catechist, you can count yourself as a “pastor of souls.” The admonition applies to all of us who help lead the parish. 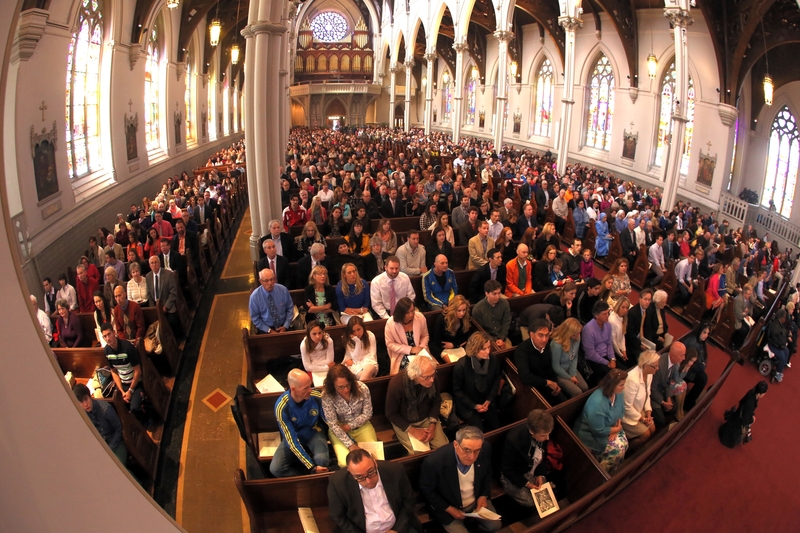 All of the reasons that we and our parishioners come to Mass are commendable. But the reason we celebrate Mass and all of the church’s liturgy is to save the world. That’s what the church teaches, and we have a duty to make sure our parishioners know that. Why do you go to Mass? How have you seen the liturgy ‘save the world’? Share your thoughts in the comments below! Image credit: Archdiocese of Boston, flickr, CC0. The answer to that first question has changed over the years, as my understanding of the Mass has deepened. At first, right after I came into the Church as an adult just over 30 years ago, I came to Mass in order to savor being with the community and to participate in the beauty of liturgical worship – both of which were important to me and part of what drew me to the Church. When I first started coming to Mass, I felt like I had come home. I knew it was all about Jesus. As I grew into it over time, I think it became more about giving praise to the Father, participating fully (especially through music) as well as being nourished and strengthened by Word and Sacrament to go out to serve others. Then, a few years ago, I read CCC 901 and my liturgical life changed. I am now also coming to Mass to offer the Father my life along with the bread and wine, through the sacrifice of Jesus Christ. Over the past several years, this has deepened into an understanding that, by offering myself, I might be changed to become a person who goes forth to do God’s will, not mine, to give myself to others in love. Now, I go to Mass to encounter, to worship, to be nourished, but also to grow in holiness and grace so that I can serve God better. Have I seen the Mass save the world? I think that the ongoing work of Catholic people makes a difference in the world. The continuous presence of Catholics – sent forth from Mass to carry out God’s mission – in the civil rights movement, the pro-life movement, the labor movement and in other areas of the public square does make a difference. Our voice is often not louder than that of the dominant culture, but it is there. And sometimes it is even heard.